I came across this quotation while preparing an article for another blog I edit. As a book guy, it resonated. It now sits atop my Facebook page; in perfect ratio for FB if you wish to borrow! Many years ago at the MissionFest event in Toronto — a sort of trade fair for domestic and foreign mission agencies — we encountered representatives from GoodSeed Canada’s Quebec branch, who introduced us to four rather unique products. They were essentially the same book but each edition was tailored to a particular audience: People who grew up aware of traditional Christianity; people whose influences were largely Eastern; people whose background was more atheist, agnostic, pantheist or New Age; and children. As a lover of apologetics, I probably would have bought just about anything they offered, but the shared characteristics of all four books intrigued me. The Stranger on the Road to Emmaus is aimed at adults and teens who have been primarily influenced by Christianity, whether Protestant, Catholic or Orthodox, but are not necessarily believers. It’s published in ten languages, with optional workbooks available in six languages. There’s also an audio book available in English and Spanish, and an interactive DVD curriculum. All That the Prophets Have Spoken is aimed at adults and teens who have been primarily influenced by Islam, but are not necessarily Muslim in belief. It has 25% different content than The Stranger and is available in five languages with workbooks in two. By The Name is aimed at adults and teens who have been primarily influenced by polytheism, pantheism, atheism, agnosticism or animism; or see themselves as a post-modern, post-Christian or secularist. It is available in English and French. The Lamb Story is a picture book hardcover is aimed at children age four and up from different backgrounds. It is available seven languages, with PowerPoint and DVD, CD audio, and DVD versions in English. These aren’t new titles. So why share them here today? I think the idea behind this set of books is exactly what’s missing right now in Christian publishing. We generally publish books for Christians. The already on-side. Preaching to the choir. Imagine having a resource that you could place in the hands of two vastly different acquaintances which was written specifically for each of them. 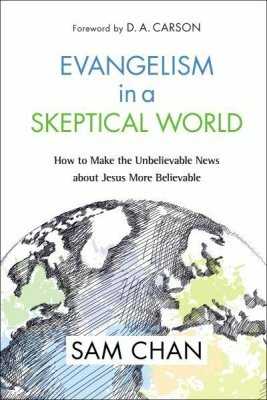 Consider the idea that instead of publishers establishing a brand through doing regular, large print, student versions and study guides, they pursue the title along the lines of different worldviews. Everybody in Christian publishing should be copying this concept to some degree. 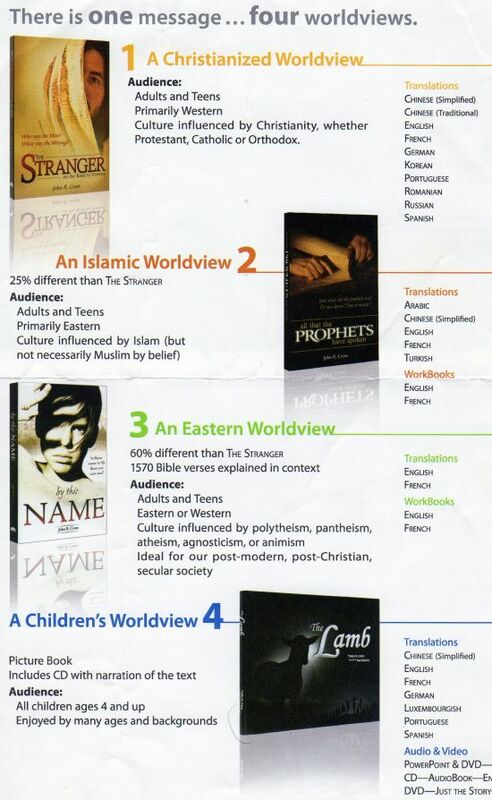 Check out the graphic image below which also lists the various languages in which each is published. GoodSeed has branches in Canada, Australia, Scotland, Germany and the U.S. You can learn more at the ministry headquarters home page, or link to find the store in the country nearest you. 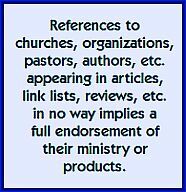 Even if you’re not in the market for this right now, take a look at the concept and remember these the next time you encounter that person for whom the existing catalog of Christian products is insufficient. Several years ago I met with a man who was a somewhat lapsed Episcopalian (or Anglican as we say here) who had been meeting on a monthly basis with some Jehovah’s Witnesses. He had a lot of questions about various issues, and so he invited them into his home and they returned regularly, staying about an hour each time. There was a time when Evangelicals were very big on the concept of door-to-door outreach and visitation. Many a Saturday morning in the 1950s and 1960s might be spent in twos or threes ringing doorbells in a local neighborhood. But as time went by, people tended to associate the “two by two” approach with only two groups: Mormons (LDS) and Jehovah’s Witnesses. These two groups took ownership of this method of proselytizing, with the result that today it’s not widely used by others. It’s Biblical. The disciples were sent out in this manner. I’m not sure that by concluding that certain groups had taken over this approach and the simply giving up, Evangelical Christians did the right thing. What contact do we now make with our surrounding neighbors? They deliver. If the last few years of Missional Church has taught us anything, it’s taught us the importance of being sent. So much of what the church calls “outreach” is really “in-drag.” Millions of people are falling through the cracks of printed brochure distribution or mall campaigns or e-mail invites. But it’s harder — though not impossible — for them to ignore a knock at the door. The people who this man met at his front door were willing to invest the time with him. On hearing that, I made sure that I took out as much time as he wanted. Fortunately, the phone at my workplace didn’t ring and no one else needed to see me. I would have given him all day. They knew their subject matter cold. He was impressed with both their depth and their passion as they presented answers to his questions and introduced their beliefs, and also how their various doctrines fit together. It’s important that we are able to do the same. It has been said that of all the religions on earth, Christians are the least acquainted with their own sacred writings. They followed up. They returned to see him several times. Hopefully through meeting with me he met someone with an equal passion for and knowledge of the true Christian faith. I encouraged him not to seek answers from the single source he has been using, and told him about a variety of resources available online. We continued meeting and while in recent years the contact has been somewhat fleeting, he always knows where to find me. Two years ago we went on a farm tour. I think the purists among the farming community call this ‘agritourism’ or even ‘agritainment.’ The owner guided us around her property consisting entirely of one ‘crop’ a somewhat obscure herb that some reading this might never have had contact with. As we stood in one place in the hot sun for nearly 30 minutes, and in the field for about 60 minutes overall, our guide was oblivious to any potential discomfort. She speaks well and clearly. She is obviously intelligent. The problem was, the farm owner had both, yet in our little group of six, I’m not sure how engaged we were. One person out of the six asked several questions however; this would represent the 15% of people in our local churches that some estimate are really into what is going on and are committed to lifestyle Christianity. Now, we knew going in what the subject matter was going to be. We just didn’t know how that would be presented. For nearly an hour in the hot sun, we were presented with answers to questions we weren’t asking, details only a solid aficionado of the subject would want to know. 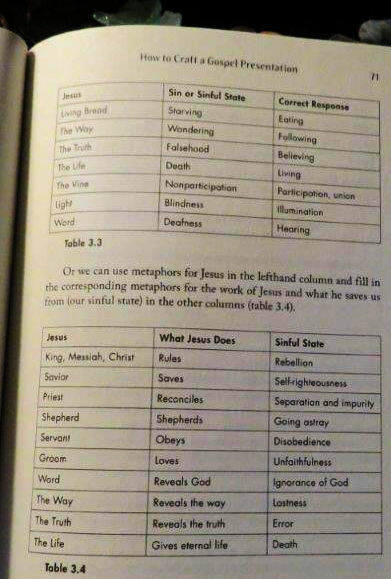 Now I know how preaching sounds to an atheist. We weren’t dragged to this event against our will; in fact we paid an admission to be there. So there was some interest, but not in the type of things that were presented. My wife noted a couple of things that were absent in the presentation; I’ll let her explain. If the medium is the message, is the storyteller the story? Our credibility is born out of who we are, and our storyteller told us a story that communicated nothing of herself, or any other people. She shared an expert stream of hows, of dos and don’ts, of whens and wheres and hows, of so many centimetres apart and deep and high, of percentages and techniques, of days and weeks and months and years – but no who. We were told that the plant was native to the Mediterranean area. So who brought it over here and why? We were told that there are 57 varieties of the plant, examples of each to be found in a separate plot of soil. Who created the variants? One little nugget that dropped was that her family had, until a few years ago, been market gardeners (implying a varied and multi-seasonal crop). She never explained how they’d made the leap from something so practical and communal to something so esoteric and exclusive. Where did this passion come from? There was no history, no personality. No identity. I met Glenn Schaeffer years ago when he was a pastor in Cobourg, Ontario, Canada; and for many years his very colorful blog, Go and Make has been linked here. These thoughts really resonated and I wanted to make sure you had a chance to think this over! 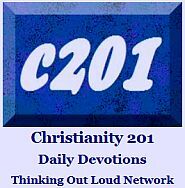 You Find It … Hyperlinked … Embedded … What is the Tendency of Your Congregation? 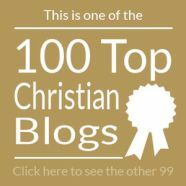 I have been blogging for a few years. As I compose articles I find there are times when, either for the press of time or simply out of sheer laziness, I simply mention a resource and hope the reader will take the initiative and find it online. (This is not my usual practice!) There are times I will hyperlink to a resource so with a simple click of the mouse the reader will be taken to the website. Other times, I embed the material right into the blog so that the reader simply scrolls down … clicks and watches what has been embedded into the blog. Other congregations “hyperlink” to their community. Vacation Bible Schools, community workshops, worship services in local senior centers, brochure distributions, radio ads, preschools, “block parties” and home Bible studies make it easier for people in their community to find them. 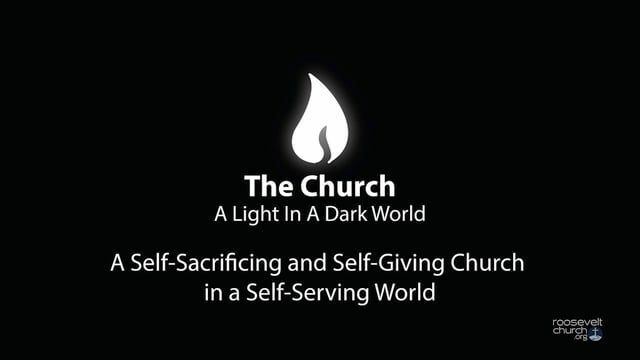 Other congregations “embed” themselves into the social fabric of their community. Member’s volunteer in a variety of community organizations … foster friendships with their unchurched friends or coworkers … develop relationships with seniors in senior care homes … invite immigrants into their homes to introduce them to western cultural practices … develop working partnerships with local organizations in their community or the neighborhood around their church building. The people of the community encounter members of “embedded” congregations almost everywhere. “Embedded congregations” don’t wait for people to find them … they find the people and serve them … love them and tell them about Christ! What is the tendency of your congregation?